120 nits and 500 nits look very different. just inform your self what a 1000 watt water cooker can do to the energy grid now add a TV show to that will show an image where the TV needs 1000 watt for about 5-10 sec. taking into account that the dolby vision screen is water cooled i'm very generous here and no there is a limited to power efficiency we are not going to make pure energy like light to use less energy. i have no problem with PQ and using a bigger colorspace both make sense. you should test for 4:4:4. Thanks, I did it before, my post is updated. But wider colorspace isn't HDR specific or am I wrong? The point of HDR screens is offering higher brightness and contrast for highlights. the problem started with the need of meta data and nit number far from any sanity. just inform your self what a 1000 watt water cooker can do to the energy grid now add a TV show to that will show an image where the TV needs 1000 watt for about 5-10 sec. That's exactly what I meant about hardware limitation. Personally, I don't like this "excuse" (I already wrote about it a bit on avsforum): looking only at HDR10 (not DV and neither HDR10+), every display manufacturer does whatever they want to do, they even change their own approach in every new series of models, nothing is stone carved, mainly due to the above hardware limitations. No its not, but for example UHD Blu-rays that use wide color and not HDR are actually relatively rare. wait there is a spec for SDR on UBD? There really are not many limitations. HDR is fully optional. 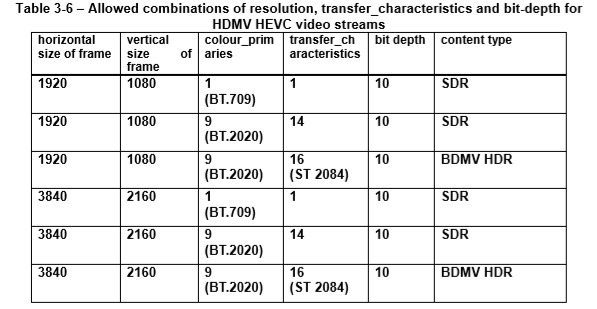 The only real limitation is that HEVC has to be 10-bit (8 is not allowed), and that BT.2020 has to use the new chroma sample location, while BT.709 uses the old one. and the UBD wiki doesn't have a video part at all. is there a read about the chroma sub sample position? chroma_sample_loc_type_top_field and chroma_sample_loc_type_bottom_field shall be set to 2. Conceptually the Chroma stuff is not that complicated. The black dots are Luma, and the Red one is the Chroma sampling location, plus the square to indicate the "area" the subsampled chroma sample covers. Typical 4:2:0 is type 0, "old" mpeg1 is type 1, and UHD now uses Type 2. I don't know of a good simple article that explains the advantages between them really. Using the TopLeft location may be simpler to interpolate, or something. so pretty much the same as SMPTE DV-PAL without interlancing. only one last thing to ask about this do lav filter and madVR honour this and are able to handle this correctly? LAV will send that info to madVR, anything else is at least out of my hands.